DAVID FABER: The Apple board. It's another thing I just was curious about. Can you stay on that board? 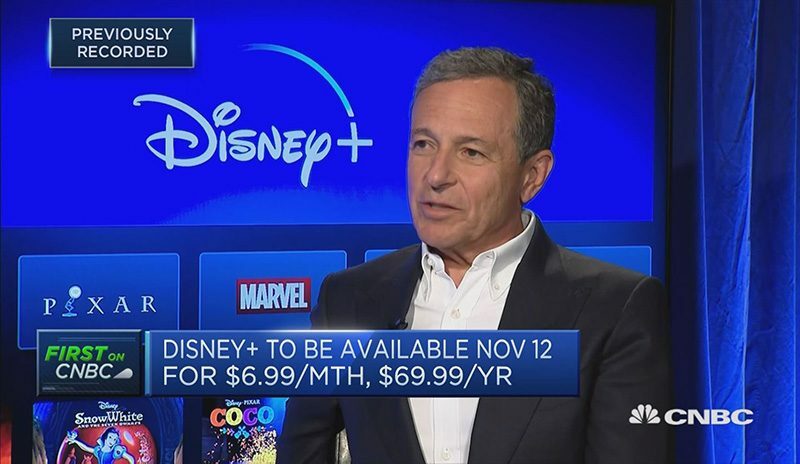 BOB IGER: Well, obviously, when you sit on the board of a publicly traded company, you have to be very mindful or your responsibilities, fiscal responsibilities to the shareholders of that company, and I have been. When the business of direct-to-consumer or television or movies is discussed on the Apple board, I recuse myself from those discussions. There aren't many of them. It's still very small business to Apple. And I'm not at the point where I, you know, I believe it's problematic, but it's something that I have to continue to monitor. Apple TV+ will feature original movies and TV shows with well-known directors, producers, and actors such as Jennifer Aniston and Steven Spielberg. The service will be accessible through Apple's TV app on iPhone, iPad, Apple TV, and the Mac starting in the fall, but Apple has yet to reveal pricing. Not gonna lie... AppleTV+ still sounds lame, but Disney+ sounds awesome. Iger is WAY smarter than Cook and it shows. Go over to DISboards or WDWForums and see what they think about Iger. From a factual perspective, AAPL has outperformed DIS over the last 10 years and is about 4 times the size. Cook added $600B in market cap to AAPL since he took over, or about 3 total Disney companies. Again, Cook has a better record with his company than Iger. Fact. He’s performed better in terms of annual returns (easily) and added FAR more total value. Iger is CEO of a media company and they STILL don’t have a streaming service. Based on market response today, they’ve been dying to have it and Disney was SUPER late. I own shares in both companies and think Disney is a top 5 company, but Cook has done better. I'm a huge fan of Apple and Disney, but in in this case there is no contest - we will be subscribing to Disney+ and passing on Apple TV+. Gotta commend [USER=696996]@Joe Rossignol[/USER] for not using that standard photo of Iger where he looks like he's blowing up the Disney World Castle. Not sure how you can glean that from quotes in an article, but it certainly doesn't show where it counts-- Disney's revenues, profits, and stock price, all of which have been flat for nearly 5 years. Business intelligent, definitely not smarter than Tim Cook, but maybe he could beat Tim Cook at chess. Did you read the part where it says he recuses himself when matters relating to competing products come up? Funny he is on the board but they cant get 4K disney in iTunes. Pushing his own company's products and services while serving as a member of the board would be a breach of his fiduciary duties. So not funny or unusual at all. I really hate the fragmentation in the streaming market, and it seems to be driven by the fact that everyone wants to own the end to end experience. I feel like the consumer would benefit much more from a separation of content providers and delivery services. If I had my druthers, I'd be watching Disney content on Apple hardware through the Netflix service. I'm starting to feel like Netflix is going to get squeezed out if it keeps heading in this direction, which would be a shame because they really did remake the face of media consumption. Aren't there many other capable people for Apple's board who don't have a conflict of interest ? I'm not sure how someone can make the comparison since AppleTV+ is still relatively unknown. You may end up being correct but I would wait till both are out before making the comparison. One note on Disney+. Customers are now expected to get another subscription when a good portion of the content used to be on Netflix ? I can't see how this favors the customer since they only used to need one subscription. Reminds me of Eric Schmidt sitting on Apple’s board before the iPhone launch. Not that i’d care about Apple’s TV service, though.